Health is one of the few attributes that connects people regardless of age, gender or social status. Making connections and finding conjunctions therefore has formed the basis of the activity of the Association of Drug and Health Device Suppliers for more than 24 years. At a time of turbulent global and local changes I find it all the more important for the individual entities operating on the health care market to stop fighting each other, and rather debate pragmatically and try to find common solutions to the benefit of all citizens. 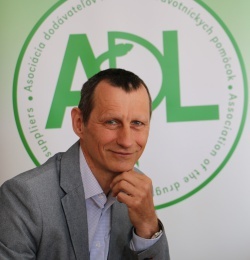 ADL is the longest acting and only association in Slovakia which unifies the complex drug chain, from pharmaceutical companies dealing with original and generic medicines to distribution companies and pharmacies. Despite the fact that other associations with specific focus have been created in recent years, the uniqueness of ADL lies precisely in the diversity of its members. This allows us to flexibly react to the situation on the health care market in all its breadth. Our goal is to continually expand the platform that allows the provision of qualified opinions reflecting the knowledge of the local environment and its possibilities. Our long-term goal, which ADL aims for regardless of political changes or market situation, is to lead a fair and open dialogue with the Ministry of Health of SR, as well as relevant professional organizations and control authorities, in order to ensure the creation of conditions for improving the business environment for our members in the area of pharmaceutics and drug policy. It is also important for us to maintain and develop the position of guarantor of professional educational activity, both for members of the association, as well as for the rest of society. I am convinced that only high professionalism, a continuous approach and transparency can guarantee the creation of positive values in the health care system, which will allow all citizens without exception access to modern, high-quality and affordable treatment.